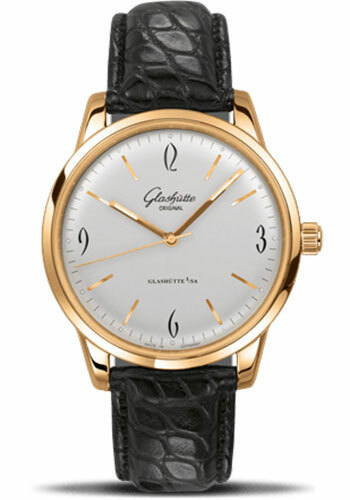 39.0 mm polished rose gold case, sapphire crystal back, domed white dial with polished hands, diamond-cut hour markers, dots of Superluminova, curved numerals according to historical models, automatic Caliber 39 movement with Hour, minutes and seconds, approximately 40 hours of power reserve, black croco leather strap with rose gold buckle. Water resistant to 3 atm. 39.0 mm polished stainless steel case, sapphire crystal back, domed white dial with polished hands, diamond-cut hour markers, dots of Superluminova, curved numerals according to historical models, automatic Caliber 39 movement with Hour, minutes and seconds, approximately 40 hours of power reserve, black croco leather strap with stainless steel buckle. Water resistant to 3 atm. 39.0 mm polished rose gold case, sapphire crystal back, black dial with polished hands, diamond-cut hour markers, dots of Superluminova, curved numerals according to historical models, automatic Caliber 39 movement with Hour, minutes and seconds, approximately 40 hours of power reserve, black croco leather strap with rose gold buckle. Water resistant to 3 atm. 39.0 mm polished stainless steel case, sapphire crystal back, domed white dial with polished hands, diamond-cut hour markers, dots of Superluminova, curved numerals according to historical models, automatic Caliber 39 movement with Hour, minutes and seconds, approximately 40 hours of power reserve, black croco leather strap with rose gold buckle. Water resistant to 3 atm.